Are you looking for a pre-owned vehicle? L’Ami Junior Mazda offers a wide selection of pre-owned cars, trucks and SUVs for all budgets. Thanks to our partner dealerships, we will find the pre-owned vehicle that you need. Come to L’Ami Junior Mazda and any of our sales advisors will be happy to answer any questions you have about the options available to you. Our pre-owned vehicles are inspected to meet the highest quality standards. At L'Ami Junior Mazda, we treat our customers with respect and dedication. You’ll never feel like a number when you come to meet us and you will see how important the quality of our pre-owned models and the satisfaction of our customers is to us the minute you walk into our dealership. L’Ami Junior Mazda offers several advantageous financing solutions for our customers looking for a pre-owned car. Our financing specialists will help you find the right purchase plan for your next car with low-interest rates and a wide range of financial products that may also be useful to you. At L'Ami Junior Mazda, we take care of everything for you. 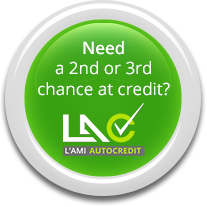 If your credit isn’t perfect, we will also be able to help you with several second chance credit financing offers that will help you buy the car you want and improve your credit. Apply for financing online or schedule a test drive today!